Over 1000 BJP workers held a demonstration in the town against the Virthadra Singh government for its alleged anti-people decisions. Later, a rally was held, which was addressed, among others, by a former Forest Minister, Thakur Roop Singh. The Himachal government has decided to develop the Pong Dam wetland into an international tourist destination on the pattern of Bharatpur bird sanctuary. Residents of trans-Giri area of the district have decided to launch a stir to press for their demand for declaring the area as “tribal”. 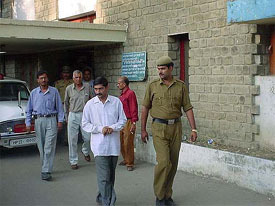 The Special Investigation team (SIT) of the Himachal Pradesh Government has made a major breakthrough with the arrest of two persons of Sarkaghat area in Mandi district who managed jobs against payment of Rs 1 lakh to an official of the Subordinate Selection Board. Encouraged by the positive response of the Prime Minister the Himachal Government has decided to submit a fresh proposal for the imposition of generation tax to the Centre. Ankur Sharma of Government Senior Secondary School, Gehrwin, in Bilaspur district has topped the plus two science examination of HP Board of School Education, Dharamsala held in March 2003. Dr J.N. Barowalia, President, District Consumer Forum here today held Airtel cellular phone company liable for providing deficient service to customer and directed the company to pay Rs 1,049 cost of Rs 200. Meanwhile, the BJP has criticised the government for reversing its decisions and lamented that the denotifications of opening new colleges and other educational institutions had sparked off resentment among the people. Addressing mediapersons, the Chachiot MLA alleged that the Congress was playing politics of revenge and was discriminating in matters of development with the people who had returned BJP MLAs. He said the Congress was setting a wrong precedent by reversing the decisions of the previous government. The Himachal government has decided to develop the Pong Dam wetland into an international tourist destination on the pattern of Bharatpur bird sanctuary. The water body which attracts over one lakh migratory birds from Siberia and other parts of the world was recently conferred the status of a Ramsar site, an international wetland, in accordance with the world convention on the conservation and development of wetlands. There are 1280 wetlands in the world, recognised as Ramsar sites and India has 19 of them. Mr Chander Kumar, Himachal Forest Minister, assures that tourism related activities would be restricted to certain selected areas to ensure that wetland was not disturbed be increased human interference. The main objective was to conserve the water body and its biodiversity and it would be carried out under an integrated plan of which tourism would be an important component over the years the man-made reservoir became a favourite staging area of the migratory winter water fowls. The wetland was a great attraction for bird watchers and conservationists. The wetland would be divided into four zones, namely protection and research zone, tourist zone multiple use area for villagers and a zone for private partnership. The tourist zone would be the swamp below the dam. The Jwali and Nagrota Suriyan areas on the right bank would developed for nature conservation education activities and the left bank for jungle safari. Camping facilities would be provided at the Ramsar and Karu inslands. The protection zone would take care of roosting sites, swamps, sand bars, mid flats and open water areas where birds nest, rest and feed. The areas on the edge of the sanctuary would be utilised for providing modern facilities like water theme parks, natural history museum, water spots, angling, fishing, boating, adventure activities, trekking trails, sand bank camping and golf course. Mr Chander Kumar said that a task force comprising officers of the Forest, Fisheries, Tourism, Science and Technology Department and pollution control board had been set up. It would prepare an approach paper for the project within two months. Residents of trans-Giri area of the district have decided to launch a stir to press for their demand for declaring the area as “tribal”. At a meeting held under the banner of Hati Samiti at Naghata village, about 90 km from here, yesterday, it was alleged that the Centre had done injustice to the area in 1967 by declaring the adjacent Jonsar Babar area of Uttar Pradesh as “tribal” and ignoring its claim to the same. Speakers said for the past 35 years the residents of the area had been demanding “tribal” status for the area but to no avail. Politicians have cheated us since 1970 with the false promise to meet this demand. Contrary to their promises, the Centre has rejected the demand, various speakers alleged. The meeting decided to launch an agitation on the issue. Prof Amar Singh Chauhan, Mr Bhav Singh Kapoor, Mr Jeet S. Kathware, Ms Nirmala Tomar, Mr Dhanbir Singh Chauhan, Mr Ramesh Chauhan and Ms Babita Tomar were among the Hati leaders who spoke. The arrested persons have been identified as Vijay Kumar and Santosh Kumar. Highly placed sources in the Enforcement Department told The Tribune that they had been booked under Sections 420, 465, 467, 468 and 120 of the Indian Penal Code. They had been charged with tampering of the board record. The sources said more arrests were likely. Meanwhile, sleuths of the SIT continued to grill various employees of the board at sensitive posts and those suspected of acting as agents of the board for providing jobs to the un-employed in lieu of money. Mr Sanjay Kundoo, IPS, and Mr G.D. Bhargav, SP, heads the team inquiring into the functioning of the board. The team has already served a 10-day notice on Mr Surendra Mohan Katwal, suspended Chairman of the board. The SIT had grilled him last week. An elaborate case is being prepared in which certain other issues concerning the development of hydroelectricity in the state have been incorporated. The proposal will be approved by the Cabinet at its next meeting. Mr Vajpayee had during his recent visit to the state said the Centre would look into the states’ demand for levying cess on hydel power generation as the hill states require new sources of revenue. The state will earn revenue worth Rs 150 crore annually if the Centre allows it to impose generation tax at the rate of 10 paise per unit. The issue was being pursued by the government for the past five years but the Centre was finding it difficult to oblige as other states opposed it. Mrs Vidya Stokes, Power Minister, said Centre would be urged to take effective measures to ensure prompt clearance of projects by various agencies and transfer of forest land. She said the government would soon take a decision whether the Rampur project should be entrusted to the Sutlej Jal Vidyut Nigam or the state electricity board. Besides, it was also reviewing the progress of projects already assigned to private parties. She said there were at least 10 projects for which even the detailed project reports had not been prepared. The results of the examination were declared today. Ankur got 457 marks out of 500 securing 91.4 per cent marks. Parima Dixit of Blue Star Public Senior Secondary School, Hamirpur, stood second securing 452 marks. Giving details, Chairman of the HPBSE, Mr. B. R. Rahi, said the board had been able to declare the results on schedule. He said 10,805 students had appeared in the examination out of which 5,491 were declared pass while 1,845 had been placed in the compartment category. The pass percentage was 51.47 per cent. Mr Rahi said students who had failed in a subject but had secured more than 20 per cent marks could apply for revaluation after depositing the necessary fee with the board. The last date with late fee for such applications would be July 5. He said candidates placed under compartment could submit their admission forms for examinations to be conducted in September. The last date for the submission of forms without late fee would be June 30 while forms with late fee could be submitted till July 31. The following students have secured the first 10 positions (roll numbers in brackets): Ankur Sharma (roll no.677414), Government Senior Secondary School, Gehrwin, Bilaspur district, 457; Parima Dixit (roll no. 637275), Blue Star Senior Secondary School, Hamirpur, 452; Tarun Gupta (roll no. 742854), Government Boys Senior Secondary School, Solan, 448; Apurav Gupta (roll no. 682082), Government BoysSenior Secondary School, Kulu 444, Sunny Kangu (roll No. 637551), Him Academy Public Senior Secondary School, Hamirpur, 442; Deepika Sood, Government Girls Senior Secondary School, Portmore, Shimla, 441; Anamika Jain (roll no. 668702) St. Paul’s Senior Secondary School, Palampur, 439; Sarvpriya (roll no. 672706) MCMDAV College Kangra, 438; Rajat Sharma (roll no. 630514), DAV College, Banikhet, 430; Sumeet Puri (roll no. 630515), DAV College, Banikhet 426; Namrita Sharma (roll no. 672693), MCM DAV College Kangra 426; Akriti (roll no.637801) Aims Public Senior Secondary School, Hamirpur, 426. Dealing with a complaint filed by Mr Harvinder Singh, the forum, observed that the cellular company has supplied him a defective “Insta cash card”, which was purchased by him for Rs 1,049 on June 2, 99. The complainant alleged that the card supplied to him was defective and it did not function after making one call on the same day. This fact was brought to the notice of the company officials inspite of that the defective pre-paid card was not replaced. The complainant was compelled to purchase another card, keeping in view nature of his duties. Incidentally the second pre-paid card was also defective and the same was replaced by the company. While deciding another complaint the forum held Uco Bank liable to make a payment of Rs 3,000 to the complainant with interest. There was an allegation that the manager of the HPMIDC branch did not make the payment of Rs 3,000 to a bearer cheque. The bank authorities have been directed by the forum to pay Rs 1,500 as litigation cost to the complainant Pyar Singh of Ghanati. The district administration has pressed into service seven tankers for supply of water in the worst-hit areas. Five tankers will cater to the needs of Bhoranj area residents. A devastating fire has been raging on the Bandla hill, near here, since yesterday. Helped by strong winds it has spread to other parts of the hill. Efforts to control it have failed so far. Animals and birds in large numbers have perished in the fire.